The best football pant on the market. Premium four way stretch poly spandex fabric. Lightweight, moisture management. 92% polyester 8% spandex. Perfect for both college and high school games since they're approved by both the NCAA and NFHS. These black with 1-1/4" white striped referee pants are Smitty's lighter weight version ideal for warmer weather climates and early season games. Perfect for both college and high school games since they're approved by both the NCAA and NFHS. Smitty's severe weather pant is a must-have for football and lacrosse referees subject to rainy and cold weather games. 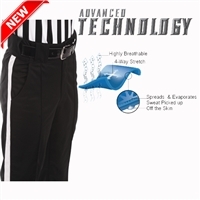 Approved by both the NCAA and NFHS these referee pants can be worn for both college and high school games. The waterproof feature of these full-cut solid black All-Weather lacrosse pants make them an excellent choice for all types of inclement weather conditions. Black football or lacrosse shorts with 1 1/4 " white stripe down outside side seam.